One of the most important elements in your restaurant, hospital, or food-processing plant is the walk in cooler. Danvers business owners count on United Service Co. for exceptional walk ins at competitive prices. Our team of qualified technicians sells, installs, and builds walk in coolers according to your unique specifications. Whether you want to purchase a top-of-the line cooler from a trusted brand or design your own unique walk in, we have the solution you seek. Come to our family owned brand for all your commercial refrigeration, cooling, and heating needs. Learn more about us. You discover there’s no walk in cooler on the market that fits your needs. You might have a unique space to work with or need a custom size that doesn’t exist. You may need specific cooling or freezing requirements. You call United Service Co. for a free quote. Our team will listen to what you’re looking for, recommend the ideal custom-built cooler, and give you a price quote. We will design, build, and install your small- to medium-sized walk in cooler in Danvers. You receive the ideal walk in cooler. Our custom-designed refrigeration systems are perfect for each individual client. No matter what your needs, we deliver. Your new cooler will be ready for business right away. In just three easy steps, your establishment will have the cooler it needs to start business. Get started with your custom walk in cooler in Danvers. We also design refrigeration equipment for large industrial applications, such as coolers forklifts can drive into to deliver pallets of food or materials. Food processing plants, breweries, and large restaurants rely on United Service Co. for expertly tailored walk in coolers and freezers. Sales and new installations. We are authorized dealers of several top brands, with the ability to sell and install your new walk in cooler in Danvers in just a few easy steps. Whether you need a cooler for a new build or one to replace your old system, our technicians will help you select the very best system for your unique needs. Walk in cooler repairs. Did your walk in break down, causing a catastrophe at your establishment? Keep our number on speed dial – our team will come out to your location in a flash. We can complete most repairs the same day, because we keep our fleet vans stocked with parts and tools. Our technicians can quickly diagnose the problem, give you a price quote, and repair your cooler. We minimize your downtime. Preventative maintenance. One of the best ways to avoid a costly breakdown in the middle of a workday is with preventative maintenance at United Service Co. We’ll come to your location on an optimized schedule to clean, inspect, and repair your equipment. That way, you’ll have peace of mind that your cooler will work when you need it most. Emergency services. If your business is in a bind, reach out to us. We provide 24/7 emergency repair services so you can continue operations without disruption. Call us any time, day or night, and we’ll come conduct emergency repairs ASAP. Don’t see what you’re looking for on this list? Inquire about our refrigeration services, and we’ll get back to your right away with an answer to your specific need or concern. With more than 100 years of combined experience, our team is sure to accommodate your needs. 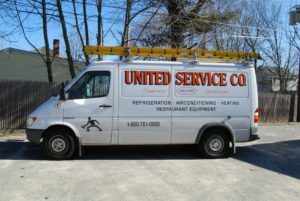 You’ll never have to worry about the performance of your walk in cooler in Danvers again with help from United Service Co.
At United Service Co., our mission is to make our customers’ lives easier. We know a walk in cooler in Danvers is far from the only piece of important equipment in a restaurant, hospital, factory, or other facility. That’s why we expanded our practice to encompass all types of restaurant equipment and commercial heating/cooling needs. We even provide residential services for home appliances. When you partner with us, you get a truly full-service repair company on your side. Come to United Service Co. for refrigeration services, walk in freezer needs, HVAC repair, restaurant equipment maintenance, new cooler builds, preventative maintenance, and more. Our friendly and knowledgeable technicians can walk you through any type of repair and recommend future services to keep your equipment in tip-top shape. We help make your walk in cooler in Danvers reliable for your business. We’ll always give you a free price quote and wait for your approval before we conduct repairs. You’ll never receive a “surprise” bill or charge! If you have a walk in cooler or other commercial refrigeration system, you need United Service Co. in your corner. We’ve helped home and business owners achieve equipment reliability and flawless performance since 1953. You won’t find another company with the same experience or dedication to quality. See for yourself – read our testimonials. Customers rave about how well we do our job and how courteous and professional our technicians are. We strive to deliver the very best services in the area. To schedule services for your walk in cooler, Danvers residents can call (800) 761-0900.